Note: Contest #1 is over, Ryan Cullinane and Michael Higdon are the winners! Please contact nickrovo at gmail dot com. Contest #2 can be found here. [By Nick] So earlier this year, Turkey Hill was taking applications for their Ambassador program. Well I decided to enter and was chosen to be one. The ambassador team was assembled basically to promote Turkey Hill's All-Natural line of ice cream. We do this through various social media platforms as well as completing missions. Due to personal reasons, I wasn't able to complete the first mission which was to hold a taste test of the All-Natural line (but you can see what Junk Food Guy did for his first mission). I actually considered resigning as an Ambassador due to my inability to be able to complete the first mission but the folks at Turkey Hill were more than understanding and encouraged me to stick with it. So here we are and it's time for Mission #2: Give away coupons for free containers of Turkey Hill All-Natural ice cream. Sounds like a good and easy mission to me. Before we get to the giveaway rules, I wanted to try something ambitious and make up for my inability to do a taste test. Turkey Hill is partnering up with the awesome Peanut Butter & Co to produce an All-Natural Banana with Peanut Butter ice cream with PB&C's Smooth Operator peanut butter (this unique ice cream will be available July-September). If you follow my sundae project, you know that I use PB&C peanut butter exclusively for my sundaes. 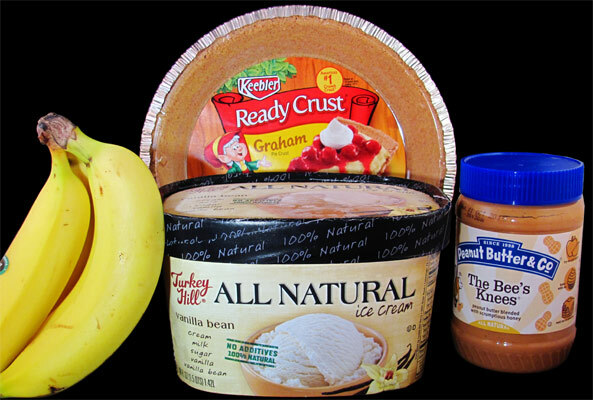 This time I'm not making a sundae though, instead I'm going to try to make a peanut butter banana ice cream pie. I've never attempted one before so this is definitely going to be interesting. First things first, I need to get me some ingredients. I decided a graham cracker crust would be the ideal container for this pie. Also, I think I need all of the Keebler elf magic possible to make this come out halfway decent. Next I had to decide on which flavor of ice cream and peanut butter to use. Turkey Hill's all natural vanilla bean ice cream seemed like the obvious choice and honey goes well with bananas so I opted for PB & Co's The Bee's Knees. Oh, and yeah, bananas. Now it's time to assemble! I scooped about 1 1/2 cups of the softened ice cream into the graham cracker crust and attempted to spread it out to form a sort of even layer. Next I poured about a half cup of melted peanut butter over the ice cream. (Note to self: let the peanut butter cool a bit before trying to put it on already soft ice cream...) Then finished that layer with around 2 medium size banana slices, just enough to cover all of the ice cream without them overlapping and into the freezer for an hour to firm up it goes. What you see here is what I ended up with after that chill period. It sure looks like...uh...something. Hopefully another layer will make things look better. This time I repeated the vanilla bean layer and in the process put way too much ice cream into the crust causing a nice overflow. Instead of doing the peanut butter first, I opted to switch the layering around. My thinking behind this is melted peanut butter looks a lot better on top than plain old bananas. 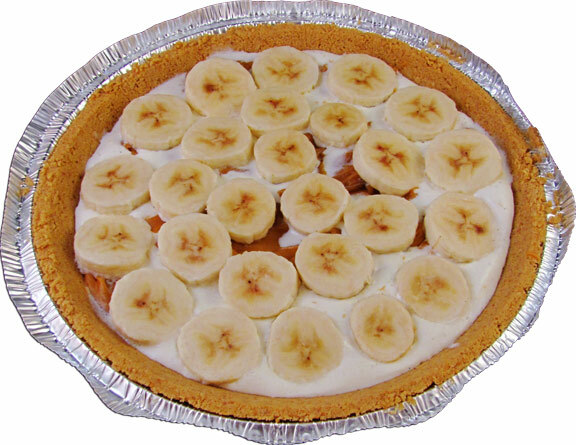 So onto the already overflowing pie goes enough banana slices to once again cover the ice cream. Onto that went about another half cup of melted peanut butter that I let cool down a little this time. This is looking like a mess, where the Keebler elves when I need them? Well into the freezer it goes for around 4 hour. This here is the final product...Yeah, it looks decent at least. I think we need to take a slice out for proper evaluating. Ahh, this looks a lot better. Not perfect but for my first attempt, it's pretty damn good. Heck, it even tastes really good. Sure, the part that overflowed was a little freezer burnt but all and all I'd chalk this up as a success. Okay, thank you for bearing with my experiment! I promised you a free ice cream giveaway so here we go. Two lucky readers will each receive three turkey hill coupons, each good for a free 1.5 quart container of their All-Natural Ice Cream. That's 4.5 quarts in total each! That's not all though. Our friends at Peanut Butter & Co want you to have some peanut butter to go with your ice cream. So each winner will not only be getting free ice cream, they'll also be receiving two coupons each for free containers of which ever Peanut Butter & Co flavor they'd like. (I'd highly recommend their White Chocolate Wonderful!) So how do you enter? Pretty simple actually. There will be two ways you can earn an entry into the contest. The first is to leave a comment** on this post telling me what you'd like to make with the ice cream if you were to win. The second is to like us on Facebook (if you don't already) and then like and comment on the post about the giveaway. While it's not necessary, we'd also be grateful if you were to share the post with your friends. While it won't earn you another entry, if one of your friends wins they just might share some with you! Pretty easy ways to earn two opportunities at free peanut butter and ice cream. Heck, I might just throw in some other goodies as well depending on my mood. You guys have until 11:59pm June 15th to enter and we'll be drawing the winners at random on the 16th. I can't wait to read all your ideas so get to entering! Would be making myself a nice big fat sundae or root beer float! A banana split would be epic with PB drizzled on top! I think the toughest part about winning the peanut butter and ice cream and trying to create something with it would be my inability to avoid just spooning the peanut butter and ice cream into my mouth as is. I would make a sundae!! I'd just make a sundae, & a milkshake. Do they have any vanilla favors, w/ brownie pieces? I'd eat that first!! Besides eating the ice cream itself as a dessert, I would use some in breakfast smoothie/shakes...the flavors are perfect for that. I'd make a vanilla ice cream, peanut butter & strawberry jam milkshake. A peanut butter chocolate milkshake! I'd make some kind of pie, like you did! I am going to bake a cookie pie and then spread ice cream in a layer over it then bake another cookie pie and put it on top of the ice cream and then I am going to put a layer of peanut butter honey ice cream over that and then I will bake another cookie pie and top the massive cookie pie ice cream shake thing and then I am going to gain about six pounds. I would make double chocolate chip cookies and a peanut butter ripple . The peanut butter ripple would be swirled into the Turkey Hill All Natural Ice Cream. Then I would make some delicious ice cream sandwiches with both (and proceed to eat them all maybe sharing 1 or 2). I would also like to try to make peanut butter ice cream bread! I'd make a milkshake. We LOVE Turkey Hill ice cream. I actually grew up with it since I am originally from Delaware. My mom would drive to a local gas station to buy Turkey Hill ice cream before it was widely available in stores! I would make a sundae and a milkshake! I'd make a sundae with the Cinnamon Raisin Swirl and the White Choc. Peanut Butter & Co flavors. And you know Nick I looove Turkey Hill ice cream so I deserve to win! I would try my hand at a peanut butter-banana milkshake! I'm not a fan of chocolate or caramel so peanut butter has always been my topping of choice. Couldn't imagine a yummier (or healthier!) treat - all-natural ice cream with the best peanut butter melted and drizzled on top! Two peanut butter cookies plus Turkey Hill ice cream sounds like the perfect ice cream sandwich treat! Peanut Butter Banana Bacon Chocolate Milkshake. Done. All of the above mixed in the ultimate smoothie. I love their ice cream better than any other company! If I won, I'd probably just eat it with a spoon but maybe I'd make some sundaes. Grilled Fluffernutters with a few scoops of All-Natural Vanilla dropped on top while still hot. I would make an ice cream peanut butter cookie sandwich! I would probably end up simply attacking each with a spoon as well! I would definitely attempt a new sundae concoction like no man has ever seen before! I would venture into uncharted sundae territory! Honestly...it would be a huge deal just for me to do the ice cream as I am recovering from anorexia. But I think I would try the ice cream in between graham crackers or with a graham cracker crumble. Oh, I love ice cream and I love peanut butter. But my boyfriend is an Ironman, meaning good food doesn't last long in our house! I would make an oreo ice cream pie! yummy! I like to use frozen bananas sliced, mixed in with peanut butter, ice cream (choc or vanilla will do) and pretzels- I've always been curious about the chocoalte PB that PB and C makes, I bet that would be amazing with vanilla! I would make a giant cast iron peanut butter chocolate chip cookie. I would top it with ice cream and wash it all down with a peanut butter milkshake. I'd make a delicious fudge ripple ice cream pie topped with ooey gooey p.b and strawberry syrup. I would make a peanut butter & banana milkshake/smoothie. My husband (whose name is also Nick) and I will be celebrating 6 months of marriage this month. Our wedding cake was chocolate and peanut butter...so I'd probably use the ice cream and peanut butter to create a sundae that reminds us of our wedding, but with all the coolness of summer. Would try to make a sundae. Though probably would end up just eating it out of the container. I would make your pie and add home made whipped cream with a chocolate/peanut butter drizzle. I'd make an ice cream peanut butter cup! 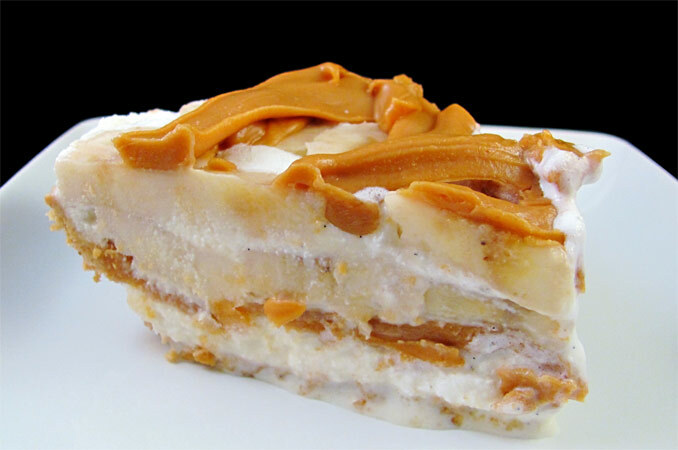 I would make an ice cream cake with peanut butter and cookie dough! Yum! In all honesty, I will probably just eat the ice cream and the peanut butter from their respective containers with a spoon. No frills. Since this looks delicious, I would definitely try it with the free ice cream....but maybe with a little chocolate drizzled over the top! Even better!! Love Turkey Hill ice cream!!! I would make a sundae with sauce made of peanut butter and chocolate chips melted, vanilla ice cream, whipped cream and jimmies. YUM! I would make my family's great peanut butter milkshake. I would make some ice cream sandwiches with the ice cream. I would also make some sundaes with the ice cream and peanut butter. Well I would let my teens eat the PB because I'm not supposed to, but everyone gets ice cream. i would love to make a ice cream sandwiches with brownies! That's easy...Fat Elvis milkshake with a touch of malt. Yum-o! I would make a milkshake. I love the Natural ice cream and buy it a lot. I never tried the Bees Knee peanut butter but had the chocolate/ peanut butter and it is good. I would get the Turkey Hill All Natural Salted Caramel ice cream to make a sundae! Adding toppings and whip cream =]. MILKSHAKES!!! 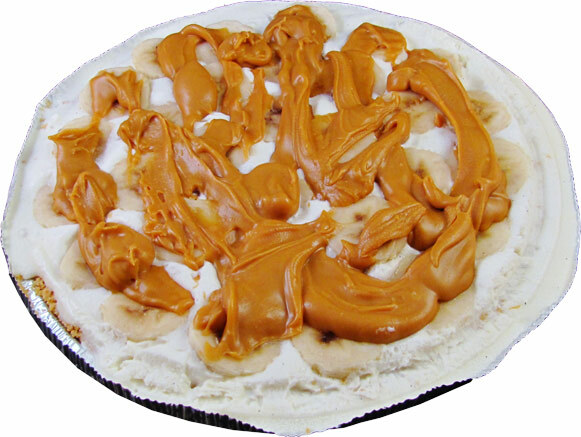 w/ peanut butter white chocolate (I've never tried that flavor) & toasted marshmallows on top. I'd love to try that pie with the ice cream! I'd also enjoy baking fresh cookies and making ice cream cookie sandwiches! I'd use the ice cream to make ice box pies! Gahhh I'm drooling just thinking of all the possibilities!